The benefits of pursuing bilingual studies within the uOttawa French Immersion Stream are plenty! You may choose qualitative grades (Satisfactory (S) or Not Satisfactory (NS)) instead of letter grades for up to 8 classes (24 units) taken in French in your first two years (60 units). Qualitative grades mean that the mark you receive for a course will not affect your grade point average, which makes it easier to maintain average-based scholarships, obtain co-op placements or apply for an international exchange, for example. You may use these grades for any course taught in French. In the case of an Immersion Course, the qualitative grade may be attributed to the content course taught in French, to the accompanying language course, or to both. Note : Students in the Faculties of Science and Engineering cannot receive qualitative grades. To request a qualitative grade, you must complete the qualitative grade request form and submit it to the French Immersion Stream office before the deadline in the University's Important Dates and Deadlines calendar (around the 10th week of class). Once your request for a qualitative grade has been approved, you will no longer be able to view your letter grade for the course. However, you may ask to remove a qualitative grade IF AND ONLY IF this is beneficial to you in order to renew a scholarship, to maintain your eligibility to the co-operative education program or to the international exchange program. In the eventuality you would be enrolling in a master’s or professional program that needs all your grades, you may obtain this information upon request at the French Immersion Stream office. The University of Ottawa's Regulation on Bilingualism allows you to write your assignments and exams in French or English in nearly any course. While we encourage you to practice writing in French as much as possible, we recognize that, in some circumstances, having the freedom to choose can make a big difference! For example, many immersion students choose to write shorter assignments in French, and longer or more difficult assignments in English. You should also make use of the Academic Writing Help Centre when preparing your written assignments in either language. Note that, in language courses, you have to write in the language being studied. For example, you cannot write your French-as-a-second-language assignments in English, just like you cannot write in English if you are learning German! The Immersion Mentors are upper-year immersion students. When you have a question or a problem, start with them: they know exactly what you're going through, because they've been there themselves. During your first year at uOttawa, meet with a Mentor to discuss your options and obtain help for making the transition from high school to university. Something we regularly hear from French Immersion students is that they have no idea how to do readings at the university level nor how to take notes during their lectures. In response to these comments, the French Immersion mentors are proud to offer two different types of “Ateliers” or workshops, which are offered several times throughout the school year. Keep an eye on your uOttawa email account and our Facebook page for dates and times of workshops. The transition from high school to university makes you nervous? That's completely normal! The FI Buddy Program helps first-year students to adapt to life on campus. First-year students, or "junior buddies", are paired with an upper-year student in French Immersion, or "senior buddy". First-year students receive advice about their program of study from a peer who has lived similar experiences not so long ago. Once the students are paired, it is up to them to decide of their means of communication - in person, e-mail or text, etc. Immersion Mentors also organize events for buddies (junior and senior) taking part in the program. You try to speak French, but feel hesitant? Your French is rusty and you feel embarrassed to talk? Enrol in a conversation workshop! The French Studies Bursary is awarded to full-time students enrolled in a direct-entry faculty or at the Faculty of Law, Civil Law Section, and in the French Immersion Studies program who are taking each term at least 2 courses (6 units) taught in French or in French-as-a-second-language (FLS). This bursary can be renewed for the three following years provided the student maintains full-time enrolment in a direct-entry faculty or at the Faculty of Law, Civil Law Section, and in the French Immersion Studies program, and is enrolled each term in at least 2 courses (6 units) taught in French or in French-as-a-second-language (FLS), and maintains a minimum cumulative grade point average (CGPA) of 5.5 at the end of each academic year. There is no application for this award. This bursary is awarded automatically to eligible students and recipients will be informed. Some exceptions may apply to students participating in an international exchange or in a program where they cannot take the required number of credits in French. and, of course "Build your own poutine" night! Visit the Immersion Club Facebook page, or contact the Club at clubIUO@gmail.com. The Carrefour francophone is the ideal place to better your French skills! 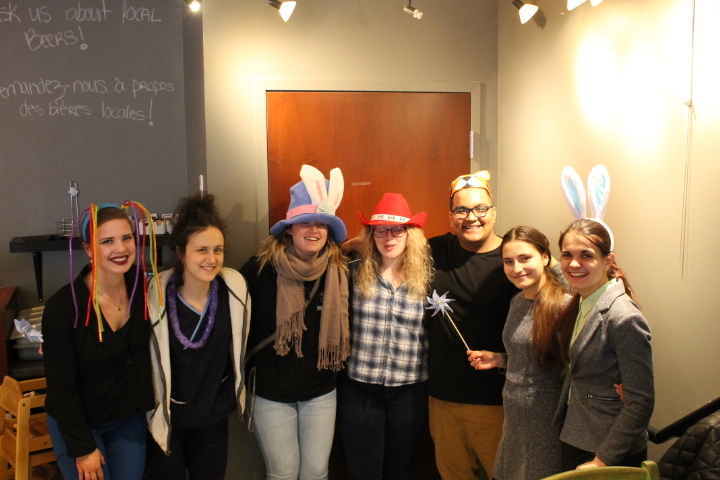 Located on the first floor of the University Centre, it freely welcomes students who wish to talk with peers, learn more about Francophone sociocultural life (on campus or in the Ottawa region), take part in events... or even organize their own! Co-op placements are an excellent way to gain hands-on work experience while studying. French Immersion students have the advantage of being able to apply to English or French positions, which increase their possibilities. Completing a co-op placement in a Francophone or bilingual environment allows you to increase your linguistic skills and bring your French out of the classroom. Students can even find their own placement! Want to travel? Want to use your French abroad? The University's International Office arranges for full-time students to spend a session or full academic year abroad through a student exchange with one of our partner institutions in more than 50 countries. Your tuition fees remain the same, as you pay them to the University of Ottawa. Students going on an international exchange also get a $ 1 000 scholarship for one semester and a $ 2 000 scholarship for two semesters. By spending some time abroad you will gain perspective and add a valuable international component to your degree. What's more, with your French skills you will have better access to living and learning in French-speaking countries. French courses taken abroad can also count toward your program requirement. The Michaëlle Jean Centre for Global and Community Engagement offers many volunteering opportunities in French. The Centre promotes lifelong community engagement and social responsibility among uOttawa students. Integrating academics with meaningful volunteer service through community and faculty partnerships, the Centre supports students in contributing to stronger communities, positive social change and a more active university locally, nationally and internationally.